If the quantity demanded responds a lot to price, then it's known as elastic demand. If the volume doesn't change much, regardless of price, that's inelastic demand. Income. When income rises, so will the quantity demanded. When income falls, so will demand. But if your income doubles, you won't always buy twice as much of a particular good or service. There's only so many pints of ice cream you'd want to eat, no matter how wealthy you are. That's where the concept of marginal utility comes into the picture. The first pint of ice cream tastes delicious. You might have another. But after that, the marginal utility starts to decrease to the point where you don't want any more. Prices of related goods or services. The price of complementary goods or services raises the cost of using the product you demand, so you'll want less. For example, when gas prices rose to $4 a gallon in 2008, the demand for Hummers fell. Gas is a complementary good to Hummers. The cost of driving a Hummer rose along with gas prices. The opposite reaction occurs when the price of a substitute rises. When that happens, people will want more of the good or service and less of its substitute. That's why Apple continually innovates with its iPhones and iPods. As soon as a substitute, such as a new Android phone, appears at a lower price, Apple comes out with a better product. Then the Android is no longer a substitute. Tastes. 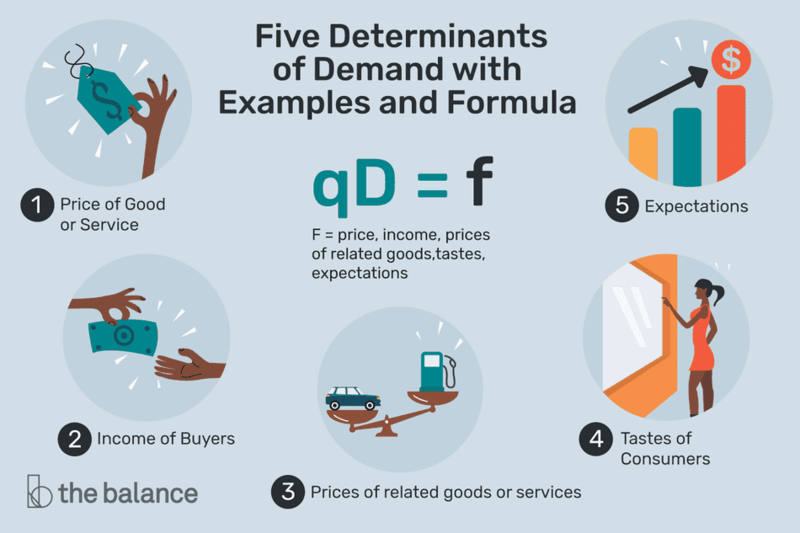 When the public’s desires, emotions, or preferences change in favor of a product, so does the quantity demanded. Likewise, when tastes go against it, that depresses the amount demanded. Brand advertising tries to increase the desire for consumer goods. For example, Buick spent millions to make you think its cars are not only for older people. Expectations. When people expect that the value of something will rise, they demand more of it. That explains the housing asset bubble of 2005. Housing prices rose, but people bought more because they expected the price to continue to go up. Prices increased even more until the bubble burst in 2006. Between 2007 and 2011, housing prices fell 30 percent. But the quantity demanded didn't grow. Why? People expected prices to continue falling. Record levels of foreclosures entered the market due to the subprime mortgage crisis. Demand didn't increase until people expected future prices would, too. Here i a Jan. 2019 update from MoneyTips about 2019 housing market predictions. Number of buyers in the market. The number of consumers affects overall, or “aggregate,” demand. As more buyers enter the market, demand rises. That's true even if prices don't change. That was another reason for the housing bubble. Low-cost and sub-prime mortgages increased the number of people who could afford a house. The total number of buyers in the market expanded. This increased demand for housing. When housing prices started to fall, many realized they couldn't afford their mortgages. At that point, they foreclosed. That reduced the number of buyers and drove down demand.